"SIR ROY AND SOUTHALL ARE UNREPENTANT BUT, IN CANADA, THERE HAS BEEN AN INQUIRY INTO THE ACTIONS OF DR CHARLES SMITH WHO WAS FOR TWO DECADES ONE OF CANADA'S TOP FORENSIC PATHOLOGISTS. HE TESTIFIED IN 45 CASES DATING BACK TO 1991, TO CHILDREN BEING SUFFOCATED, SODOMISED AND SHAKEN. MANY OF THOSE PARENTS HAVE SINCE BEEN EXONERATED. 'I BELIEVE I HEARD WHAT I WANTED TO HEAR,' HE ADMITTED AT THE INQUIRY IN JANUARY." 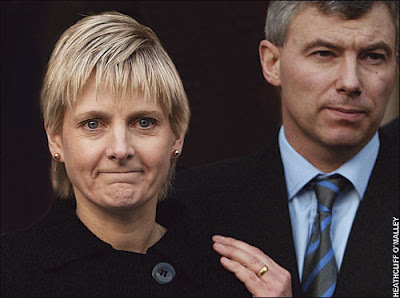 In 2003 Sally Clark was released from jail after being falsely accused of murdering her two sons. She never recovered from the trauma and died a year ago, effectively of a broken heart. Jardine has written many times exposing the madness which has led to innocent British parents and caregivers being wrongly convicted of killing children. This moving story ran in the Telegraph on March 16 of this year, under the heading, "Has Sally Clark's case changed attitudes to infant death?" "Exactly a year ago Sally Clark died, aged 42, while her solicitor husband, Steve, was on a business trip," Jardine's article begins. "In other words she never recovered from the nightmare that began on December 13, 1996, when her first son, 11-week-old Christopher, stopped breathing. Mothers never get over the death of a baby, though they may move on. For Sally - once a bright and capable solicitor - even that was not possible. Two years later her second child, Harry, who was eight weeks old, also died suddenly. From that moment Sally received not sympathy but condemnation. Paediatricians decided - in line with what was then current thinking on child abuse - that two deaths in a family was suspicious and a Crown Court jury found her guilty of murdering both of her sons. 'Die, woman, die,' other prisoners shouted out as she climbed into the prison van. What happened next made legal history. In January 2003, after serving three and a half years of a life sentence, Sally was freed. The defence at her second appeal revealed that Harry's body had been riddled with the bacterium staphylococcus aureus, which would have caused a form of meningitis - information that the prosecution pathologist Dr Alan Williams had not shared with Sally's defence at her trial. Others charged with similar crimes, however, hoped that lessons would be learnt from what was called in the Court of Appeal 'one of the worst miscarriages of justice in recent years'. The way the medical evidence was presented to court was 'shoddy', said Dr Sam Gullino, a forensic pathologist from Florida, who prepared a report for Sally's second appeal. For a short while it looked as if the tide had turned. Inherited disorders were found to explain other babies' deaths: three other mothers, Trupti Patel, Angela Cannings and Donna Anthony, accused of shaking or smothering their own children, were found not guilty or had their convictions quashed. Meadow's Law - named after Prof Sir Roy Meadow - was discredited: no longer were two cot deaths in a family to be deemed suspicious and three murder unless proved otherwise. But, the cheers were short-lived. Fast-forward three years to last November. Once again the scene is a courtroom. This time the woman on trial is mother-of-two Keran Henderson, a childminder who was looking after 11-month-old Maeve Sheppard at her home in Iver Heath, Buckinghamshire, in March 2005 when - according to Keran - the child suddenly went floppy. Maeve died in hospital two days later, and Keran was accused of having caused Maeve's death by shaking her violently, having lost her temper over a dirty nappy. As the verdict of guilty was delivered, Keran let out a piteous wail. 'If you could hear, as we did, the sound of that woman's grief you too might think her honest,' Mike Seckerson, the foreman of the jury, said. But it wasn't this alone that caused him to reveal his 'disgust' at the way the trial was conducted. He and the other medically unqualified jurors were bombarded by information from a dozen medical experts. The majority of the jury 'listened to expert opinion and thought it evidence', leaving Seckerson with the unhappy task of delivering a majority verdict with which he disagreed. Seckerson is not alone in fearing that yet another terrible miscarriage of justice has occurred. 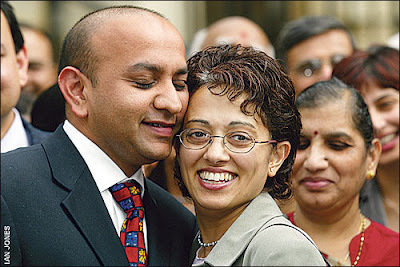 Jack Straw, the minister for justice, has been inquiring solicitously about Keran's comfort in prison, says her husband Iain, who is campaigning to bring his wife home to their nine- and 14-year-old sons. Neighbours have rallied around in support of a woman who had been a respected childminder for seven years, ran the local Beaver Scout group, helped elderly neighbours and was always up for any charity event. Neither of her own children has ever suffered at her hand. Significantly, Maeve had been in and out of hospital during her short life, yet none of this counted. Someone had shaken the child, medical experts concluded, on the basis of certain signs. 'As an ex-policeman, I can't get my head around the fact that people are found guilty without any real evidence,' Iain says. He is shocked that no one from the police or the CPS that he encountered was medically trained. Keran is not the only person in prison for a crime that might never have occurred. Suzanne Holdsworth, another childminder, is three years into a life sentence for causing the death of two-year-old Kyle Fisher who also, she says, went floppy. Doctors have compared the bleeding in his brain with injuries that would occur as the result of being thrown from a car at 60mph, yet he was not bruised and the banisters against which she supposedly battered him bear no traces of DNA. Chaha'Oh-Niyol Kai-Whitewind is in prison for suffocating her son, though her appeal may reveal natural causes as an alternative explanation for his nosebleed and blood found in the lungs. Criminal convictions for harming children are just the visible tip of the iceberg. A far greater number of cases, where the evidence is insufficient for a criminal trial, are heard in the family courts, where on the 'balance of probabilities' parents are deemed to have harmed or (yet more vaguely because of 'personality disorders') be capable of harming children who are then removed from them, often at birth. Information about family court cases is hard to obtain. Proceedings are secret so no one knows which experts are saying what, though observers note clusters of similar cases involving certain consultants. Parents claim that they are being accused of emotional and physical abuse on the basis of theories or syndromes that are not as foolproof as is claimed. In the year since Sally Clark died, those facing family court proceedings have at last acquired a champion in the form of the Liberal Democrat MP John Hemming who set up Justice for Families after his girlfriend's baby was nearly taken from her because she had once failed to report a stillbirth. His office at the House of Commons contains files on more than 200 individual cases, which he uses to identify patterns and lobby for changes in the law. 'I hear of a new case almost every day,' he says. 'Smothering' has gone out of fashion as an accusation. So has 'salt poisoning', which Ian and Angela Gay were accused of. 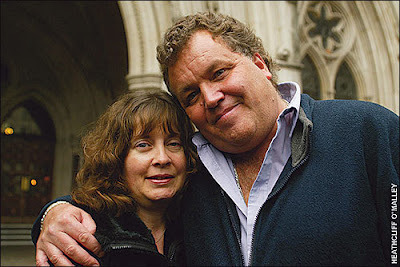 The couple were released from prison in 2006 when it was shown, at appeal, that their foster son Christian Blewitt suffered from a faulty osmostat, which allowed his body to accumulate fatally high levels of sodium. They had not, as was claimed, force-fed him teaspoons of salt. There remain, however, two controversial medical diagnoses: shaken baby syndrome (SBS), a cluster of symptoms deemed to indicate shaking; and metaphyseal fractures, which are fractures at the ends of the long arm and leg bones, believed to denote that a child's limbs have been wrenched. Events usually start with a paediatrician or radiologist who flags up the possibility of non-accidental injury (NAI). Social workers and police officers then look for evidence, sometimes ignoring information about good character or happy family life. And often solicitors acting for the defence are 'supine', says Bill Bache, who having successfully represented Angela Cannings and the Gays is now working on Keran Henderson's appeal. Bache, like Hemming, has many suggestions for improving the system: a thorough multi-disciplinary discussion of possible causes of injuries or illness before cases proceed being one of them. At the heart of the problem, he says, lies 'angled dogmatism' on the signs and symptoms of abuse and a willingness by some doctors to give opinions outside of their areas of expertise. The drive to hold parents accountable for abusing children began in 1962 when a Colorado paediatrician, Dr Henry Kempe, published his research into 'battered child syndrome'. Drawing on 302 cases of abuse of children under three, he concluded that 'beating of children is not confined to people with a psychopathic personality or of borderline socioeconomic status'; parents often denied causing the injuries but 'to the informed physician, the bones tell a story the child is too young or frightened to tell'. It had always been accepted that psychopaths, addicts, sociopaths or even women suffering from post-natal depression could harm children. Kempe was saying that apparently normal, loving people could be abusers. His research changed the role of paediatricians; it became their task to spot hidden abuse. Identifying the signs provided a useful career opportunity for ambitious doctors in the 1970s and 80s. Dr John Caffey in the US wrote the first influential paper establishing SBS in 1973. In Britain, Prof Sir Roy Meadow, author of the ABC of Child Abuse, rose to fame on the strength of his 1977 academic paper on Munchausen's Syndrome by Proxy (MSbP) - children made ill by attention-seeking adults - based on the behaviour of two mothers, one of whom had (Sir Roy claimed) poisoned her toddler with salt, while the other had contaminated her child's urine sample with her own blood. Knighted in 1996, Sir Roy was soon lecturing on the hidden epidemic of abuse and appearing as an expert witness. By the time he gave evidence at Sally Clark's trial, Sir Roy claimed to have found 81 cot deaths which were in fact murder though, unfortunately, he destroyed the data. He told the court that he could think of no natural explanation for either of the Clarks' children's deaths and quoted the case-clinching statistic that the chances of two cot deaths in one family was one in 73 million - a figure arrived at by multiplying the incidence of one death (1:8543) by itself. It later emerged that the chance of a second death was more like one in 120 because there could be an underlying defect. Though struck off by the General Medical Council in 2005 for 'gross professional misconduct', he was reinstated the following year. The other leading light in the drive to unearth hidden abuse in Britain was Prof David Southall. Working on aspects of MSbP in the late 1980s and early 90s, he videoed parents whom he suspected of suffocating children. Thirty-three parents or step-parents were prosecuted, though the evidence may have been unreliable: clasping a child to the chest could, for example, indicate feeding rather than smothering. The Clark case was also his undoing when, having merely seen Steve on tele?vision, he stated to police that it was 'beyond reasonable doubt' that Steve had murdered his sons. A three-year ban from child protection work followed in 2004; in December 2007 he was struck off for, among other charges, concealing the medical records of some 4,500 children. Sir Roy and Southall are unrepentant but, in Canada, there has been an inquiry into the actions of Dr Charles Smith who was for two decades one of Canada's top forensic pathologists. He testified in 45 cases dating back to 1991, to children being suffocated, sodomised and shaken. Many of those parents have since been exonerated. 'I believe I heard what I wanted to hear,' he admitted at the inquiry in January. But the fall from grace of some of the theorists of abuse has not made as much difference as expected. The term 'noble cause corruption' has entered the language. The tainted term MSbP has fallen into disuse, only to be replaced by another set of initials, FII - Factitious or Induced Illness. Real abuse is still being missed, as in the case of Victoria Climbié, partly because social services are busy investigating false allegations. Change is slow, says Penny Mellor, who campaigns against non-scientific medical syndromes such as MSbP, because a small coterie of expert medical witnesses are sticking to theories that have been undermined by subsequent research. Sir Roy's portrait still hangs in the London offices of the Royal College of Paediatrics and Child Health. 'Why not? He is a past president,' says Prof Terence Stephenson, the dean of the medical school at Nottingham University and the college's vice-president for science and research. He is one of the doctors who has adopted attack as the best form of defence in response to the fall of Sir Roy and Southall. Speaking as Professionals Against Child Abuse, they argue that doctors are being victimised by parents and the media who deny the reality of child abuse. 'Protect doctors to protect children,' he wrote to the Prime Minister in February, following a report on the case of Jessica Randall, whose abuse at the hands of her father was missed by 30 professionals. False allegations campaigners consider Prof Stephenson a 'hawk' who has appeared in 50 cases: he prefers, he says, civil cases where a single expert witness is jointly appointed. 'In criminal cases you have to be willing to be countermanded and cross-examined' - although later he says that 'an expert is only tested by being challenged by another expert'. Stephenson comes across as a pleasant man, driven by a passionate belief in his cause. I want to question him about evidence that casts doubt on current orthodox thinking. Diagnosis of SBS is based on a triad of symptoms: subdural haemorrhages, retinal haemorrhages and cerebral edema (swelling of the brain). The triad is important because regardless of other evidence, such as the absence or presence of bruises, these symptoms - particularly retinal haemorrhages - are used to diagnose abuse. Sally Clark would never have been put on trial had Harry not been found (erroneously it transpired) to have bleeding behind the eyes. Equally, Jessica Randall was never put on the 'at risk' register because MRI and eye scans showed no retinal haemorrhages. Dr Jennian Geddes, a neuropathologist, has suggested in the Court of Appeal that the triad need not arise from shaking. Choking could be an alternative. 'She admitted in court that it was only a hypothesis,' Prof Stephenson says dismissively. There is research, too, which shows that the triad can result from a fall from only 3ft, as from a bed. 'Fewer than three per cent would get retinal and subdural haemorrhages,' he replies. But are children who fall from beds always tested? We move on to the other contentious area - meta?physeal fractures. Stephenson appears equally dismissive about possible alternatives to a diagnosis of abuse. Yes, but they are also hard to see and radiologists won't look for them unless the possibility of abuse has been flagged. When I suggest that paediatricians, especially those appearing regularly as expert witnesses, appear to have fixed minds, he counters by making a derisive comment about Dr Colin Paterson, a pathologist struck off by the GMC (General Medical Council) for suggesting for the defence in 30 cases that children could suffer from temporary brittle bones, resulting in multiple fractures. Infants are being diagnosed with rickets resulting from vitamin D deficiency due to insufficient exposure to sunlight. 'Only in ethnic minorities.' Not according to research from Birmingham University, which states that one in eight Caucasian children has rickets. The problem with grey areas is their tendency to become black and white. The doctors who see a child in hospital believe absolutely in what their colleagues have published - that what they are seeing is child abuse - and alert social workers and police. They in turn hire expert witnesses who believe in the abuse diagnosis. 'Money is certainly wasted pursuing these cases, but I'm more concerned about the human cost,' says Bill Bache, who speaks of distraught parents not allowed to be left alone with their dying child in hospital because they have fallen under suspicion; couples often forced to live separately and encouraged to blame one another; and children denied the comfort of family life. Yet some children do die of natural but unidentified causes. Cot deaths, for example, dropped from 30 to seven per week after 1990, when parents were advised not to put babies to sleep on their fronts. Though they may not acknowledge it, doctors can also cause harm by giving inappropriate treatment. The routine practice of resuscitating children by putting them on a drip is one that worries Penny Mellor, who campaigns on behalf of parents who claim to be wrongly accused of child abuse. 'If they aren't dehydrated, putting more fluids into them can cause swelling of the brain and bleeding,' she claims. More information is needed to protect the innocent - children, parents and, indeed, doctors. When the history of false allegations is written there will be a roll-call of honour for those who have taken a fresh look at the medical conundrums and questioned orthodox thinking. 0: and Dr Chuck Hyman, who has investigated a link between short umbilical cords and weak bones. 0: and Dr Paul Johnson, who has asked courts to take obstetric history into account. It is not easy standing against the tide, says Dr Squier, a prosecution witness at the trial of Keran Henderson. She identified brain damage but said there was no evidence that the child had been shaken, which led to tense discussions among the medical experts. Despite her caution, a dozen experts who were prepared to theorise about shaking won the day and Keran Henderson is now serving a three-year prison sentence. I asked her husband Iain whether he thinks that, even if exonerated, she will emerge, like Sally Clark, a broken woman. 'I don't know if she'll survive,' he replied.